Bay View Resort offers many great amenities, from Starbucks coffee on-site, indoor lazy river and pool and of course location in the heart of Myrtle Beach right off the Boardwalk. When you step out your front door you are close to everything from restaurants, shops and of course some of the best attractions around like the Myrtle Beach Skywheel. If you are heading to the beach to spend the New Year with us, we want to make sure you have everything you need to celebrate in style. 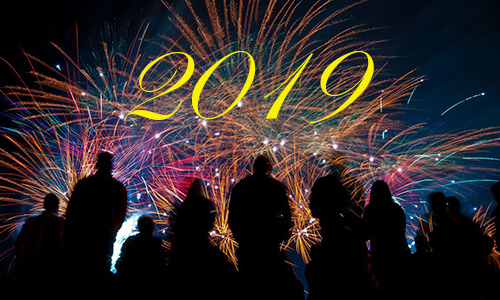 There are several options for you if you want to head out and celebrate with other visitors and locals, or you could just order in, watch the fireworks from your balcony over the ocean and toast to 2019. If you want to venture out, here are some great ideas for you to consider. Market Common — A Southern Times Square: At this shopping/dining/entertainment hot spot in Myrtle Beach, New York City’s famous Times Square New Year’s Eve celebration gets a decidedly Southern makeover. The fun activities offered at past editions of this New Year’s party have included a live-stream of the Times Square festivities on a jumbo screen, a mirror-ball drop at midnight and a fireworks show starting just after to welcome the new year with a bang. You can bring the little ones, too, as kids’ entertainment such as bounce houses and face painters will be provided. Live music and a selection of Market Common food and drink vendors will also keep the atmosphere festive all night. For more information, visit marketcommonmb.com. Murrells Inlet MarshWalk — New Year’s Eve on the MarshWalk: For those looking to head for the Southern Strand to ring in the new year, this half-mile wooden boardwalk bordering a saltwater estuary in historic Murrells Inlet will have plenty of fun on tap. Each of the MarshWalk’s eight restaurants will offer great dinner and drink specials as live music emanates from all stages, and a fireworks show at midnight will welcome in 2019. Visit marshwalk.com to learn more. More Fireworks Shows: At North Myrtle Beach hot spot Barefoot Landing and top Myrtle Beach attraction Broadway at the Beach, free fireworks shows will light the Carolina skies this New Year’s Eve. At Barefoot Landing, the New Year’s Eve Fireworks Spectacular will get rolling at 7 p.m., while Broadway at the Beach will light the fuse on its Fireworks Extravaganza at 8 p.m..
As you can see there are lots of activities to choose from and we know you will have the best celebration as we say goodbye to 2018 and hello to 2019. Happy Holidays from Bay View Resort and we hope to see you soon!